Lacy Thomas, National Sports and Conditioning Association Certified Personal Trainer, has carried her love of sport to her passion and career in the health and fitness industry. Sports have been apart of Lacy’s life since she was 5 years old. Following her multi-sport athletic career in Basketball, Track and Volleyball, Lacy attended Clark College and knew she wanted to help others become healthy and fit! There she met her husband and business partner, Trevor Thomas, and together began fostering proactive health through Personal Training. 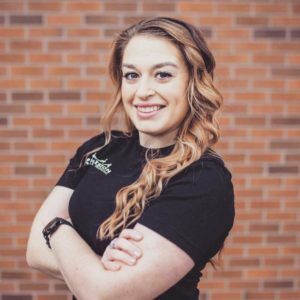 Lacy is also a Certified NASM Fitness Nutrition Specialist, and continues her pursuit of knowledge every year to provide the highest level of service to her clientele! Interested in Training with Lacy?